This unit will convert NTSC/Pal or VGA signal into NTSC/Pal or VGA. Offers premium conversion quality. 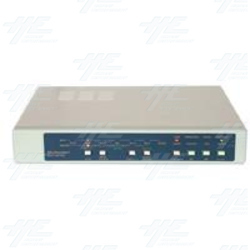 This converter has auto signal detection & 8-bit Broadcast Quality Color Decoding. It also can receive the Secam signal as at input. This unit will convert NTSC/Pal or VGA signal into NTSC/Pal or VGA. Offers premium conversion quality. This converter has auto signal detection & 8-bit Broadcast Quality Color Decoding. It also can receive the Secam signal as at input. Converts any video system to any other video systems and PC display system. When converting PAL(50hz) to PC mode, its frame rate is converted to 60 Hz, to ensure vertical frequency is compatible with some 60 Hz-only LCD-display monitor. Digital conversion from input TV signals of NTSC 3.58, NTSC 4.43, PAL, PAL M, PAL N, SECAM to output signals of NTSC 3.58, NTSC 4.43, PAL, PAL M, PAL N, PC (640x480) 60Hz, (800x600) 60Hz, (1024x768) 60Hz. 8-bit Broadcast Quality Color Decoding. Easy touch button for input and output system selection and picture adjustment. Built-in Time Base Correction (T.B.C.) function for signal synchronization. Built-in Automatic Gain Control (A.G.C.) function ensures 1 Vp-p output signal (Input level can range from 0.5Vp-p to 2Vp-p). TBC is active constantly, even in the bypass mode. Adjustable control on contrast, brightness, color, tint and Horizontal/Vertical phase. Innovative image processing circuitry ensures outstanding color, motion and picture detail.